Many employers turn a deaf ear to employee satisfaction survey. They think that the members of staff who have worked for the company for a dog’s age are happy in their workplace, that they love their jobs and their roles. They think that workers are satisfied with their enterprise position and will continue to move the company forward in good faith. The form is a list of important pre-written questions, all suitable for the survey process, so that you won’t have to spend time to write your own set of questions. Guesswork cannot help you to know whether an employee is happy with their job. Therefore, you should use this form to gather enough data to help you with your survey. 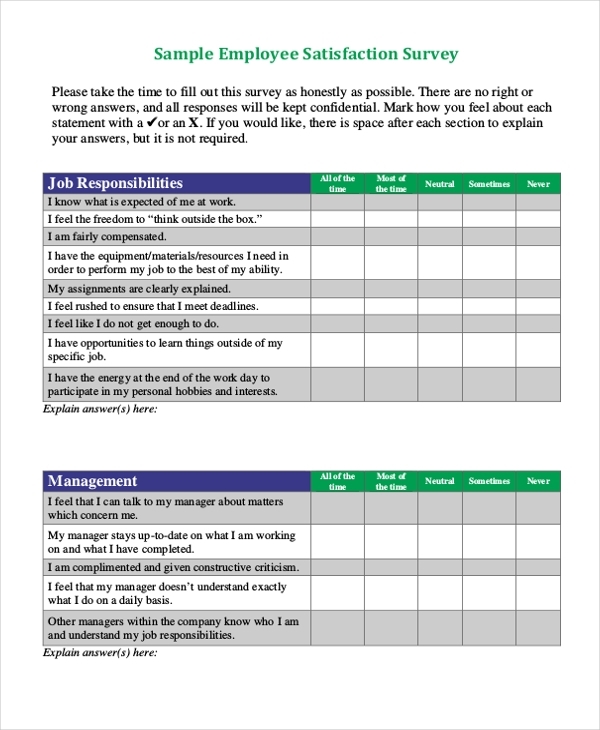 This form is for employers who want to found out what employees think about their workplace and the employment. Overall, you don’t have to edit the template because it is print ready. Working in the hospital can be quite difficult. As an employer, you need to do the best you can to make sure that employees are happy about their jobs. First, use this template to conduct a survey. What do court employees love about their work environment? Does a worker in this field love their job? 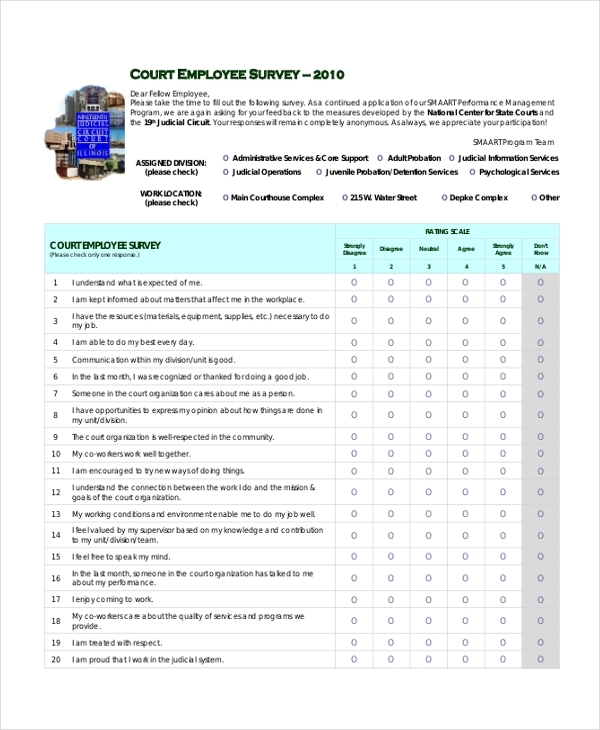 The only best way to answer these and many other work-related questions is to use this form to conduct an employee survey. Whether you have been in the healthcare business for a decade or less than a year, it is important to know what your employees feel about the job that you’ve given them. 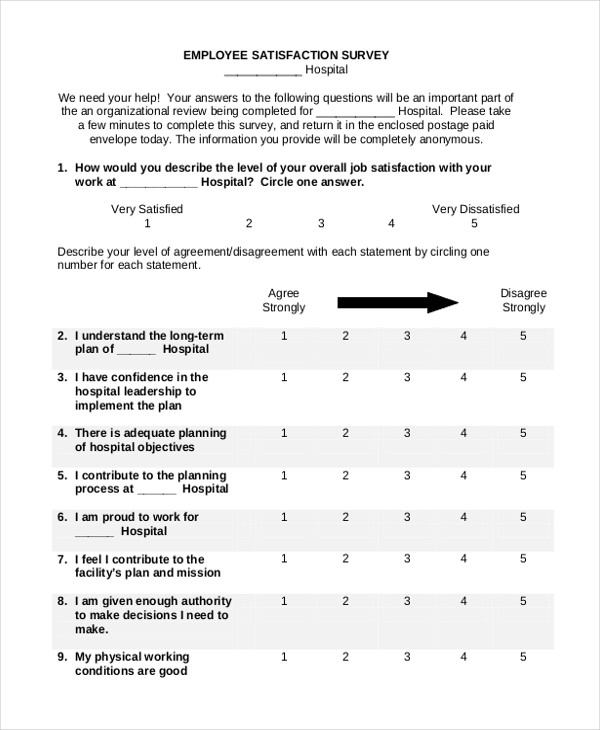 By using this form to engage an employee in a survey, you are able to know what they think and feel about their job. Your company can use the results of the survey for informed decision-making. 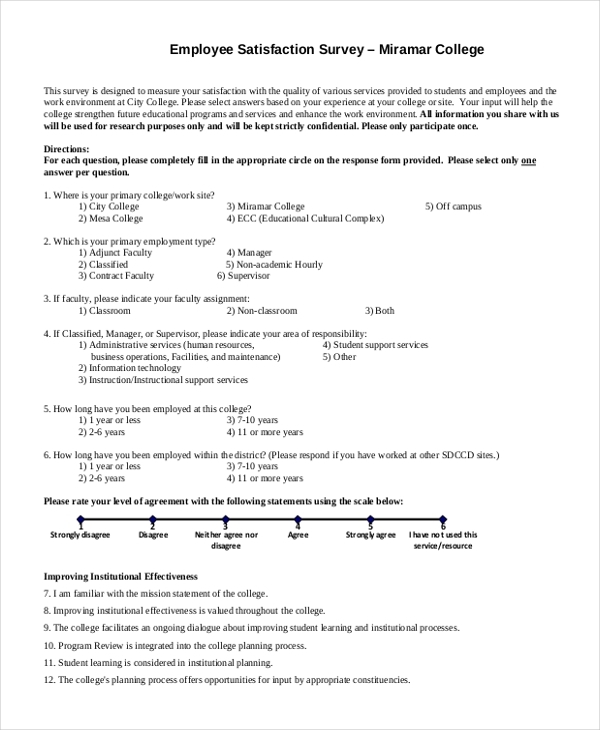 You can’t tell if an employee working for your college is angry or worried about a work-related issue unless you conduct a survey. You can use this template for the analysis. What are the advantages of conducting an employee satisfaction survey? Can an employee satisfaction survey reveal how an employee feels about their employer? While it is easy to think of the survey as being only subjective, there are instances when the results of the evaluation do reveal clear, objective conclusions. In approaching this question, therefore, it is necessary to consider the duration of the relationship between an employee and their employer. Because the review process often lies on the professional side of the research, rather than a mix of personal feelings and objectivity, it is safe to conclude that the analysis can help to give a clear picture of what employees know about their employers. It is, however, difficult to arrive at conclusions overnight, which is why it often takes the time to conduct and complete the analysis. Can a survey help employers to gauge the likelihood of an employee’s continuity of the company? Employees are likely to give crazy responses, but how can you know where your company stands if you don’t let your workers speak? Honestly, you cannot. As such, the best thing to do is to accept the responses as they come and use the results to create professional working culture for the company.